Rhianwyn of the Caderyn is conflicted about giving up a warrior’s life to become a wife and mother, but her love for her new husband is enough to at least make her consider it. However, with the conquering Gaians moving ever closer to her homeland a peaceful life may no longer be an option, for Rhia or for any of her people. I had great pleasure reading Wildcat. Apart from your obvious talent as a writer, I have such admiration for your meticulous research. The Gorvic’s body jerked and twisted in her grip and she let go the hank of hair, leaving the dying man to collapse on the muddy ground. When they’d arrived at Broken Stream the fields had been nothing but a vibrant green on both sides of the water. Belenos had been shining overhead when the two warbands first faced each other across the little ford, and the stream had been clear and bright and gurgling merrily along its way. Now the sky was overcast and warriors from both sides lay dead or dying all around. The ground had been churned up into a treacherous mire of mud and the stream was now tainted by the blood of wounded fighters. The scene might have been another world entirely, somewhere far away from the tranquil valley it had been this morning. Though the change in its image was as nothing to the change in the sounds of this once-quiet place. This morning Broken Stream had known little noise but the trickling of the waters and the singing of the birds. Then the Gorvicae had come and they and the Caderyn had traded insults and boasts, jeers and challenges, and the air had been alive with the voices of warriors, all daring each other to attack first. Then the two sides had charged, and the insults and challenges had changed to warcries and screams, and the sound of iron meeting iron and of iron meeting flesh had combined to fill the valley with the dreadful song of battle. And Rhianwyn, daughter of Carradan, revelled in it. She cast her eyes around to find another Gorvic to fight, her eyes wide and almost feverish, her hands shaking in anticipation. This was her first true battle, the first time she had taken the field to defend her people, and the fear she’d felt before it had melted away into something like lust as she sought out another victim for her long knife and narrow axe. Remembering that the latter weapon was still embedded in a Gorvic’s guts, she crouched down and began working it free of its fleshy prison, all the while looking around her at the carnage. Even with her limited experience Rhia could tell the Caderyn had all but won, and she screamed out in wordless triumph as her axe came free of her enemy. She held the weapon high above her head as she looked around the bloody field. Nearly all the Gorvicae were fleeing back across the stream, only a few dozen still fighting of the two hundred who’d come here this morning. Rhia saw Caderyn fighters encircling the few who were still refusing to run away, and her breath caught in her throat as she took in the long iron swords and rigid white hair of their warrior elite. These were the Gadarim: The Mighty. 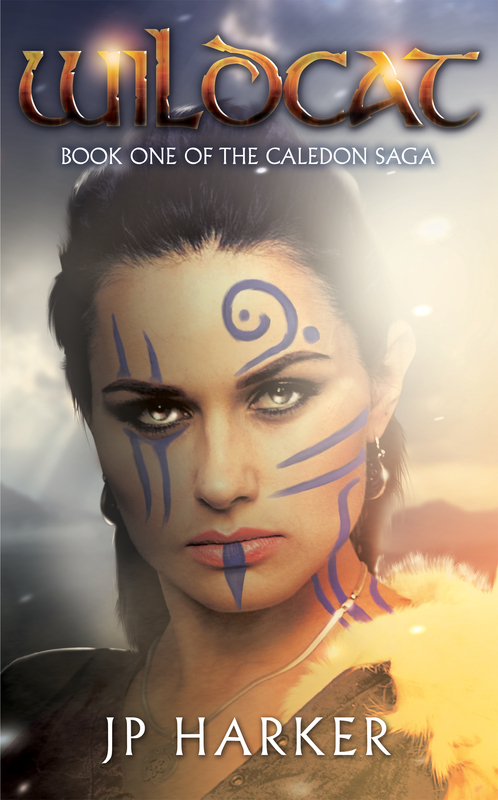 The finest of the Gorvicae fought with their hair twisted into spikes and bleached blindingly white with lime and Rhia knew that, like the Gadarim of her own people, the patterns on their skin were made of more than simple woad. Rhia, like every warrior on that field, had painted her body with swirling shapes of bright blue, to attract the favour of the gods and inspire terror in her enemies. Twin snakes writhed up her arms from wrist to shoulder, one of them continuing up her neck and around the ear to cover her cheek. She was liberally sprinkled with blood and grime by now, and sweat and struggle had caused much of the warpaint to smudge or fade, risking the chance of the gods losing sight of her in all the chaos. The men of the Gadarim had no such concern. Though they had painted over them before the battle to make them brighter, the spirals and whorls on their bodies had been tattooed there to shine forever, ensuring that Taran and Mabonac would never lose sight of their most favoured warriors. For the most part only their faces had mere woad to decorate them today, the honour of permanency there being reserved for the greatest of fighters. Rhia wondered for a wistful moment if she might know that honour someday, but she shook her head at such a foolish notion. Female Gadarim were a rare thing. Instead she settled for looking around for more Gorvicae to kill. She spotted one, a lad of about her own years, who seemed torn between running back across the stream and running forwards to where the Gadarim fought. She decided to make his mind up for him.